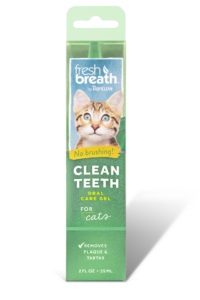 Oral care is about more than making your pets’ smiles sparkle–it’s an important component of their overall health. In fact, 80% of dogs begin to show signs of oral disease by age 3. 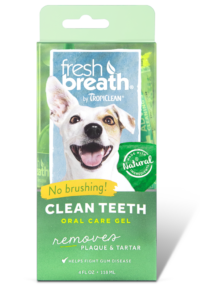 Our Fresh Breath Clean Teeth Brushing Gel clings to your pets teeth providing a 360 degree clean as it helps break down plaque and tartar. Depending on your dog preference, use the TripleFlex brush or one of our Finger Brushes. Gently brush in a circular motion. QuestionCan I use this without brushing? 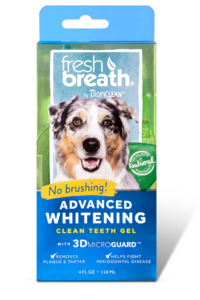 My dog hates any kind of brush, can I just rub this on his gums? Yes, you may apply this by rubbing it on their teeth and gums or even squirting a little into each side of their mouth. They will lick for approximately 30 seconds and this is normal as their tongue is acting like a toothbrush in this fashion, coating the teeth and gums. Both brushing and non brushing have proven effective, although the brushing method generally yields results faster. Thank you for using TropiClean Pet Products! I HAVE A YORKIE OF 10 YEARS. HE HAS A LOT OF DENTAL PLAQUE, I WANT TO KNOW IF THE GEL WOULD SERVE HIM. OR YOU SHOULD FIRST HAVE AN ANTIBIOTIC TREATMENT PREVIOUS TO THE USE OF THIS GEL. Thank you for your inquiry. While we do believe that our oral care gel will assist in the removal of plaque and tartar, it may be wise if you have a scheduled antibiotic treatment for your pet, to consult with the veterinarian providing the treatment before introducing a new product to him/her. we appreciate you taking the time to consult with us! 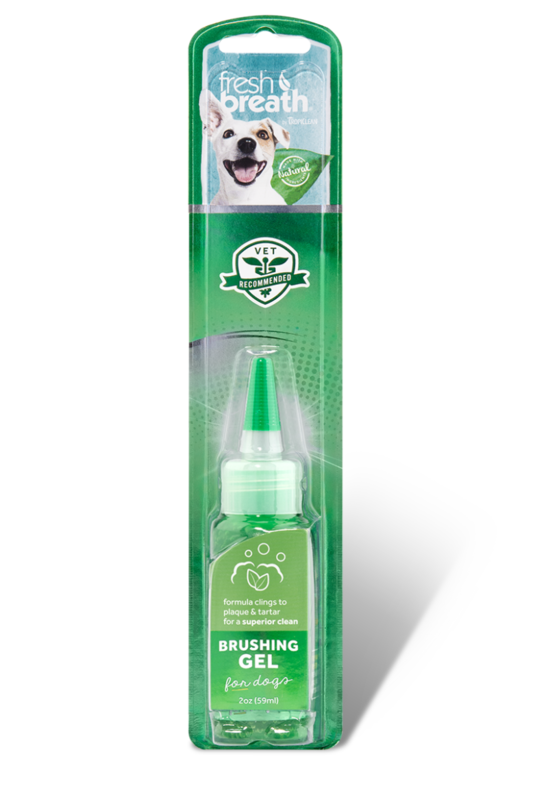 Squeeze a small amount of Clean Teeth Brushing Gel onto the brush and allow your dog to taste. Reapply and gently brush in a circular motion. Never use human toothpaste, which can upset your pet’s stomach. For maximum effect, withhold food and water for 30 minutes before and after treatment.